Mega Menu elevates the design of your site by letting you put a greater design spin on your menu navigation. Use an image, form, or accordion module within the dropdowns to create dynamic submenus that enhance the user experience on desktop and mobile. All of this made super easy within Divi builder, which is a game changer for those wanting ease and efficiency. Create and modify the Mega Menu from the Divi Builder, pull in any module that you can use on a given page (even Divi BodyCommerce modules). This was exactly what I needed. I had a site with a very custom menu with jquery animations. When you added a submenu it would not have a dropdown. It just added the menu item as part of the original item and just appended the title. The customer liked the menu but really needed a submenu for services. I bought this product as it looked like it would work. And guess what it worked perfectly now they have a dropdown menu on hover that I just designed as a library item. It paid for itself on the first use as I didn’t know how I was going to make this work without some custom solution or just making a standard lame menu without the animation. I have Divi Nitro and this plugin and not only are both great plugins, but the support is the best in the industry! Peter is always on the facebook groups helping and has helped me numerous times in those groups with stuff not even related specifically to his plugins. When it comes to his plugins he has always been willing to check out the error(normally just my own misunderstanding of the plugin) and tell me how to fix it. He is super responsive and helpful and updates his plugins quite often. One of the best and most helpful divi plugin developers I have found. Thanks so much for your help. Amazing tool to show anything you want inside your menus as easy as building anything else.. Photos, videos, maps, Buttons, Toggles etc. It really has great value since you can showcase customers the most important info and guide them where you want them to go right from your menu with no need to even scroll down the page. I keep coming back to this plugin. So much easier to use than others I’ve tried that are overly complicated. Whatever you build in the Divi library can be in your mega menu. Simple. This plugin offers a really simple way to make the divi menu more useful. There is no limit to integrate functions of the divibuilder and that‘s really awesome. Forms, Tabs etc. I think it is the best of all mega menu solutions out there. Tried Quadmenu but it can‘t compete with this plugin. Each and every product released by Divi Engine has made my life simpler; improved my work on websites and reduced my stress. Divi Mega Menu does not disappoint. Want to have a mega menu link that displays a map on hover- DONE. want to display some rate information on hover – EASY. Having Divi Builder available to enhance your menus is such a gem. 10/10 for Peter’s newest plugin! Peter has done it again; I needed a plugin that would allow me all the creative freedom of the Divi Builder – in a mega menu. He delivered an awesome tool, that will help me take my client’s sites to a whole new level. Using this mega menu plugin with Divi is the best option available; no need to learn a new page builder layout, no need to be constrained by conflicting css styles, no need to use another child theme. Activate, drop the selectors in the menu item, and voila – you could have entire pages show up as a mega menu drop down. Because it’s using the Page builder, in theory, every Divi plugin and special layout is totally possible – within the confines of a mega menu. And it also stacks perfectly for mobile. The beauty of using a Divi pagebuilder-based menu means you can control what shows up on mobile, in what order. Kudos to Peter! Our documentation explains how to use Divi Mega Menu. I have followed the steps but my Menus are not showing! In most cases, the Mega Menus will show – sometimes child theme developers leave out a Divi action in the footer.php file. If you add this to your child theme it will work perfectly. 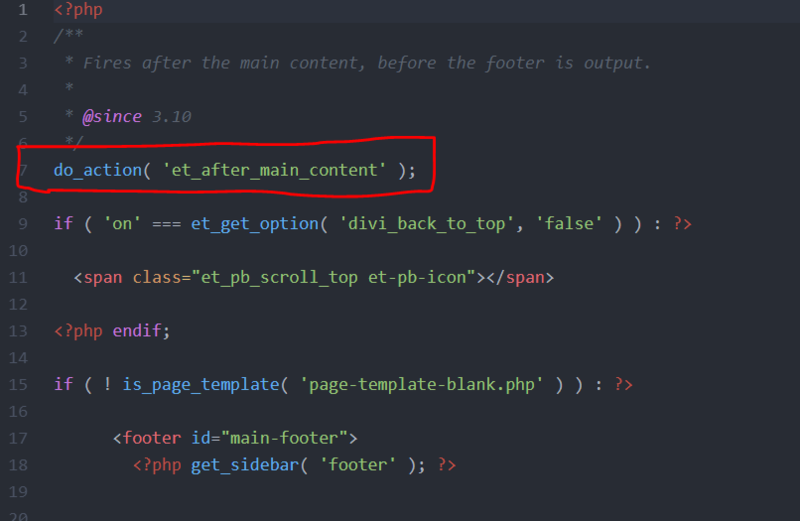 Add the following to the top of your footer.php file just under the opening <?php tag. How do I hide my Mega Menu on Mobile? We have written a guide for you on how to do this, read about it here. Essentially you create two menu items and hide the one on desktop and hide the other on mobile. General Can I get a refund? Due to the nature of digital products, it’s impossible to prevent fraud and still offer refunds. Therefore, we do not offer refunds. We do however offer support to fix any issues you may have with the plugin if it is directly related. If it is a compatibility issue with other plugins (other than WooCommerce for Divi BodyCommerce) we cannot be held responsible for this. We have however worked with our customers to make our plugins compatible with various plugins on request so please let us know. If there is an issue directly related to our plugins and we cannot fix this, we will consider a refund at this point (case by case). General What about customer support? We take pride in supporting our customers. If you need help of any kind, you can access support through your account – just submit a ticket and we will get back to you asap. We love to help you and often will go above and beyond, however, we only support aspects of the plugins and not custom coding such as CSS. General Do I get updates? All our plugins come with updates so long as the license is activated on your website.